Lines of clerks sitting behind typewriters under flickering fluorescent lighting as they stare out of grimy windows wishing away the time before they can take their next coffee break. They feel tired, productivity is slow, and creativity is zero. Now we all know this scene from hell has thankfully been consigned to the dark and distant past and that we now all sit in offices with LED lighting consisting of stylish modern luminaires that imitates Rayleigh scattering, making us feel happy, alert and extremely productive. Or has it, and do we? Despite study after study proving beyond doubt the link between good lighting and wellbeing, productivity and creativity, bad office lighting persists. And it’s not just about being able to see well, it’s also about appreciating what you see. But what then, is good office lighting? In our opinion it’s about not compromising functionality and efficiency for an aesthetically appealing luminaire. Neither is it having to settle for something that is mundane and possibly even ugly. Of course, ‘good’ is subjective, but there are plenty of guidelines as to what is considered ideal and standards that need to be followed. These guidelines usually specify ideal as a perfect combination of light level, illuminance, light colour and direction, while still ensuring the lighting solution reflects the brand and delivers a pleasant work environment. Indirect light and avoiding sharp contrast in ceilings helps to get rid of unwanted glare. While lighting designers can turn to UGR charts to help them assess glare ratings to make informed decisions these ratings can also be misleading. The ideal is to create a balance of natural and artificial light that avoids strong shadows, reflections and glare but keeps the office aesthetically appealing by using various light sources and a suitable amount of contrast lighting. It is important to have a combination of direct and indirect light to create an integrated lighting concept that looks good and supports task lighting without casting too much light on the floor. We see office lighting trends moving towards miniaturization and a discreate look with LED as the main light source. It is possible to cover the whole light spectrum with LEDs making them the ideal lighting solution for indoor office environments where a mix of mood and task lighting is required. 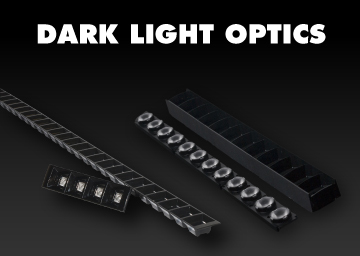 And of course, all this light needs to be controlled, for which we need secondary LED optics. 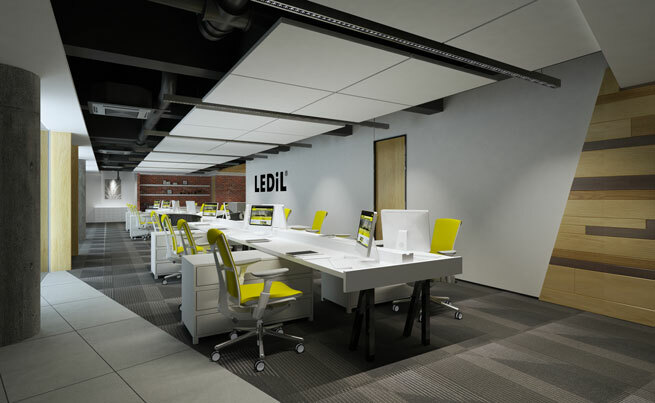 LEDiL offers a range of dark light optics: DAISY and FLORENTINA have been designed specifically for offices. They make sure the light source is invisible from almost all angles making glare close to non-existent, something that is especially important close to work stations. Offices also contain other spaces such as corridors, coffee rooms, reception areas etc. for which optics from the LINNEA and FLORENCE families as well as from various track and spot lighting families are suitable.